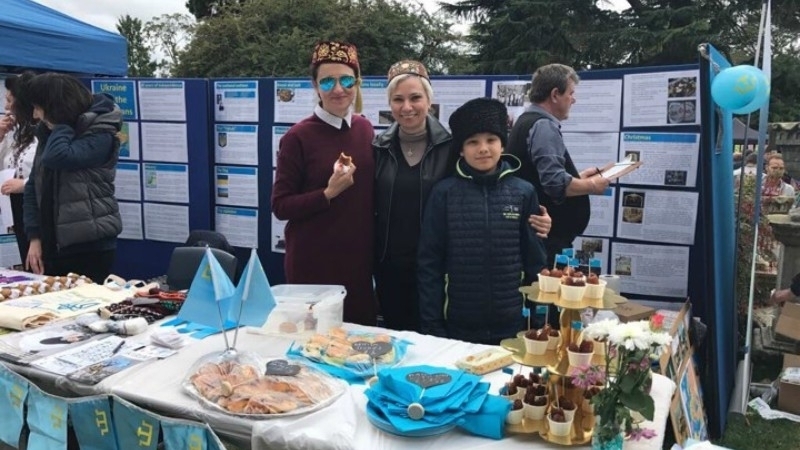 Within the framework of the Spirit of Ukraine festival, the Crimean Tatar and Ukrainian cultures were demonstrated in all their glory. September 10, London hosted the fourth Spirit of Ukraine festival, organized by the Ukraine Charity Foundation and the Association of Ukrainians in the UK. Ukrainians who had emigrated to England, have been preserving Ukrainian culture for many decades, teaching Ukrainian language and folk dances in Sunday school. The main goal of this festival is to familiarize the English people with different aspects of Ukrainian culture. Each guest can enjoy folk songs and dances, taste dishes of Ukrainian cuisine and buy a small souvenir. However, this year the boundaries of the festival have expanded significantly due to the Crimean Tatar stand. Professional dancers - the Kazan Tatar Diana Tauddinova and the Crimean Tatar from Bulgaria Vahiddin Rainov - performed the national dances Haitarma and Tym-tym for all those present. Eleven-year-old Omer Maksudoglu recited a poem "Ant Etkemen" (Crimean Tatar hymn, - Ed. ), and pianist Tamila Karydzhi recited the poem "How does the Homeland smell?" Translated into English verse by Lilia Budzhurova. Of course, guests were treated to traditional dishes of the Crimean Tatar cuisine. And throughout the festival all the guests were told about the history of the people, from the first deportation of the times of Catherine II, till today's events.